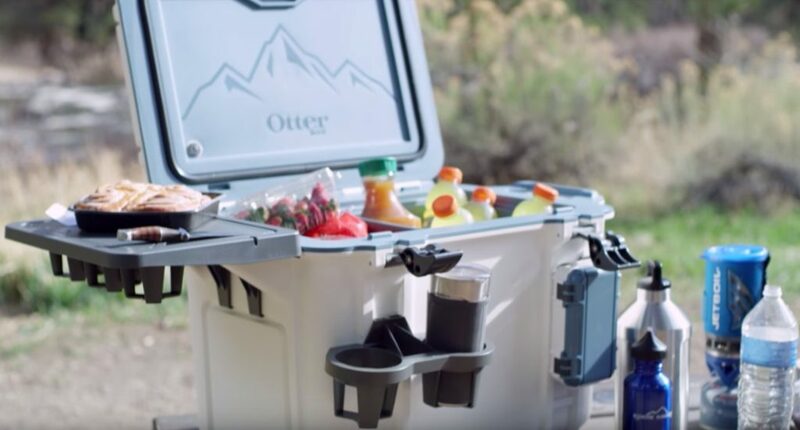 OtterBox are known for their hardhitting, high-quality phone cases, but they also make coolers to rival big roto-moulded cooler brands like Yeti and Pelican. 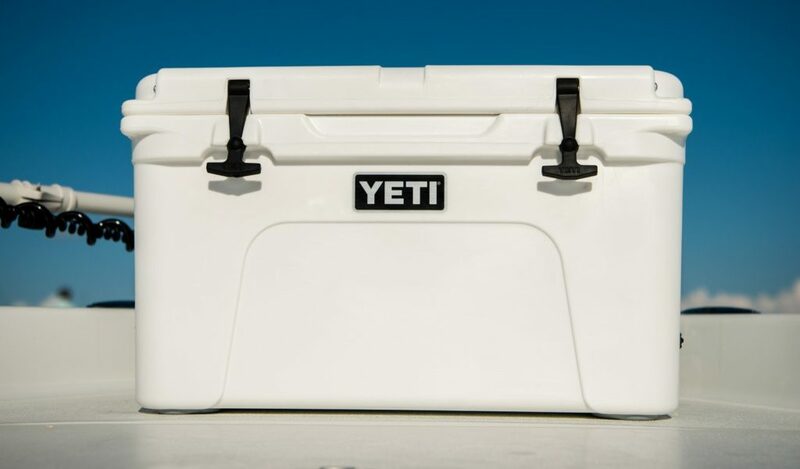 How does the OtterBox cooler hold up against the Yeti Tundra coolers and which cooler is going to be the better buy? When compared to the Yeti the Otterbox is similar in both price and features. Both have a sturdy roto-moulded construction filled with injection foam and can keep ice for 7+ days. The OtterBox does have a lifetime limited warranty (vs Yeti’s 5 year warranty) but it’s mainly stylistic design that differentiates the Otther from the Yeti. It has a dual color design, external handles that protrude out the side and a unique external attachment system for attaching accessories like bottle openers and dry boxes (purchased separately). Ultimately personal preference will determine which cooler is best for you. 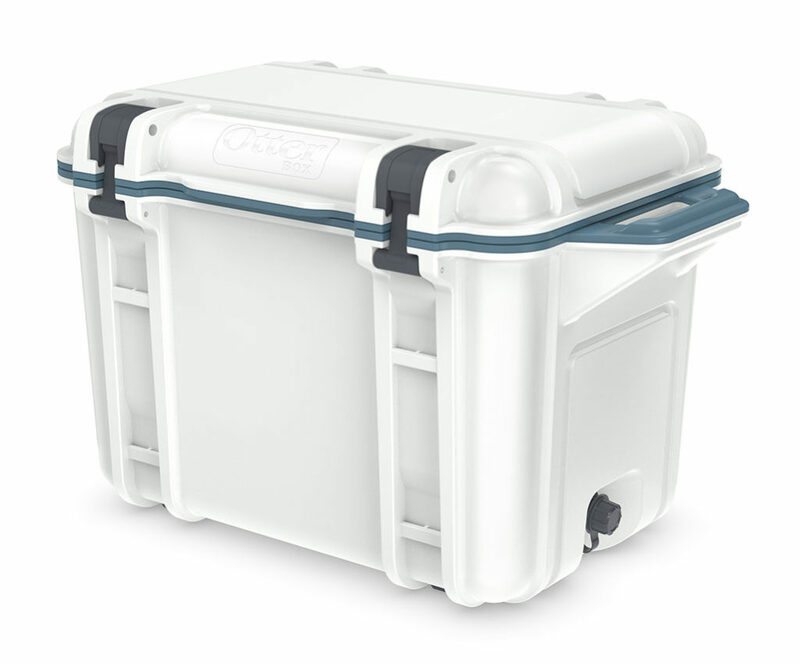 I say basic but really these are top of the line features that both Yeti and Otterbox have that make them stand out as premium roto-moulded coolers and worth the hefty price tag they carry. These qualities really differentiate them from your average $50 you might pick up from your local hardware store. Both coolers are made out of roto-moulded polyethylene plastic. When combined with the insulation they create some of the toughest, most robust coolers on the market. We are talking stand on them, run over them, pull them behind a moving vehicle, drop them, heck even give them to a bear and they will still hold up. 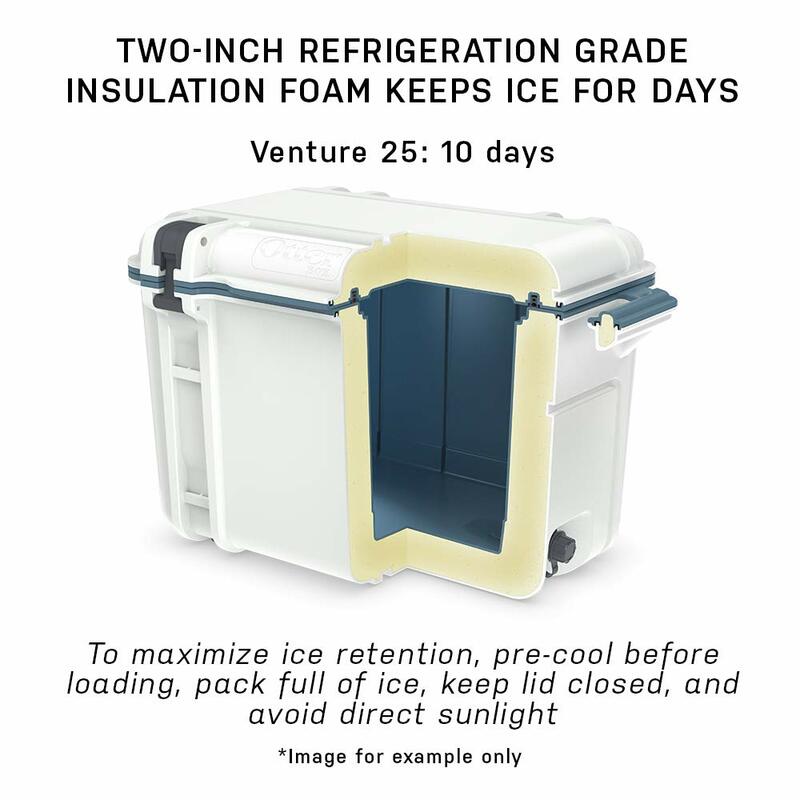 Both coolers are injected with polyurethane which forms a rigid insulation panel, further adding to the strength as well as giving it the crazy ice retention that each cooler has. Each cooler has 2-3 inches of insulation in the walls and approximately 3 inches in the lid. I have personally tested the ice retention of the Yeti as well as seen countless ice test videos. I can confirm that Yeti can easily hold ice for 5 days and even as long as 10+ days in cool shady conditions. OtterBox claim to have 10-16 days of ice retention but real world usage seems to put it at similar ice retention to the Yeti, maybe slightly better. 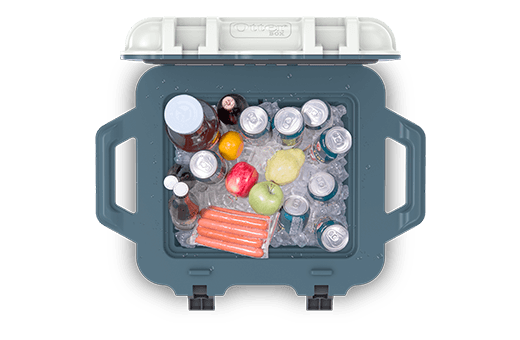 Each cooler lid has a commercial grade gasket that keeps the cold air in and the warm air out, which helps to keep ice longer. When combined with the tension from the rubber latches it also makes the cooler leak proof. The non-slip feet are awesome. 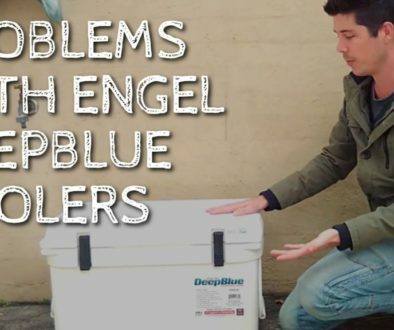 It means you can place the cooler in the back of your truck, van or boat and it won’t slide around like crazy. It’s not perfect, it does still slide around a bit in my van when I accelerate or brake quickly, but tied downs can be used to really keep it in place. Both coolers are certified bear proof IF you lock them with padlocks. The OtterBox requires a specific bearproofing lock kit (which costs a whopping $99.99!!!) while no special kit is needed with the Yeti, just 2 padlocks on each of the front corners. Rather than cheap plastic hinges each cooler uses a solid metal pin for the hinge. This adds to the durability and means the lid isn’t going to detach from the body of the cooler. As mentioned previously the roto-moulded construction makes these coolers ridiculously durable. 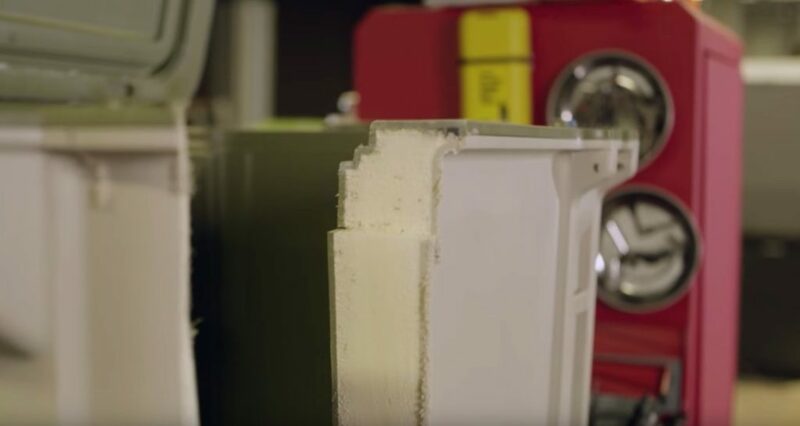 I love the below video from OtterBox which is really funny, it show just how durable these coolers are. Unlike a lot of coolers that aim to be like Yeti but cheaper the OtterBox has almost identical pricing to the Yeti. 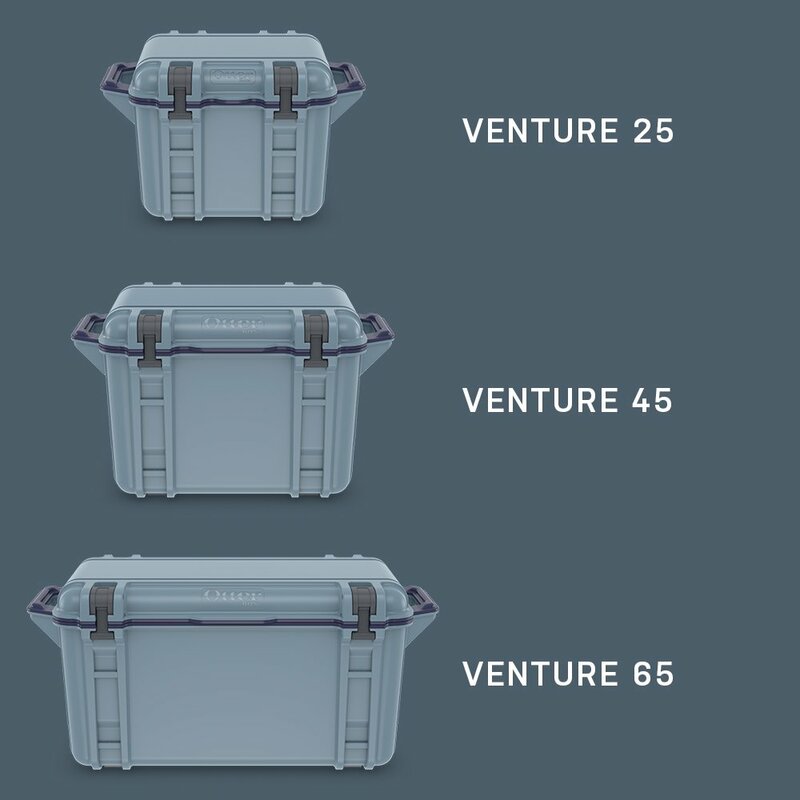 Looking at the side-by-side comparison of OtterBox vs similar size Yeti’s we can see that there is very little different in pricing between the two coolers, if there is even a difference at all. Often when comparing coolers price is a major consideration. It can be worth it to sacrifice a bit of brand recignition or quality in order to save hundreds of dollars. However, in this case price really isn’t a consideration at all. So what we need to look at now is what makes the OtterBox stand out from the Yeti (if anything). What Makes OtterBox Stand Out From Yeti? The OtterBox has a few distinct features that set it apart from the Yeti. None of these features are earth-shattering and none of them really set the OtterBox apart as a superior product to the Yeti. It does however offer consumers a different choice. Have a look through these features and if they are important to you then an OtterBox may be the better cooler for you. OtterBox coolers are both designed and manufactured locally in the USA. This means by purchasing an OtterBox you are helping support local jobs. 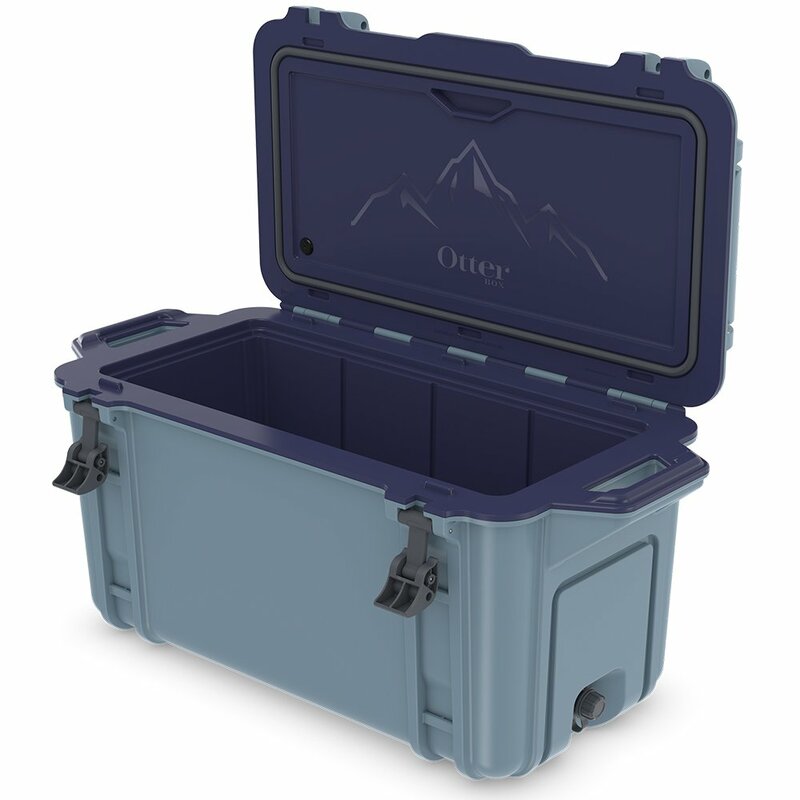 OtterBox Venture coolers have a unique dual color design with the interior being a different color to the exterior. This creates a really cool effect which sets it apart from the Yeti which comes in just 3 uniform colors (White, Blue, Tan) and the occasional limited addition run of other colors like Pink. The OtterBox has handles that stick out from the side, a lot like the Pelican range of coolers. 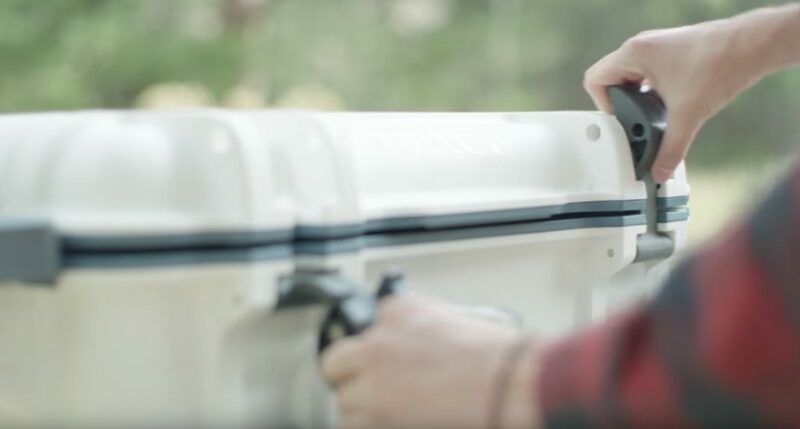 While on the surface this looks like it would make the coolers more ergonomical and easier to carry, in practice the handles simply take up extra space in your trunk, back of your truck, van or boat. It means you can’t park your cooler flush up against a corner in order to save space. So while not a deal breaker this is one feature of the OtterBox coolers I don’t like. 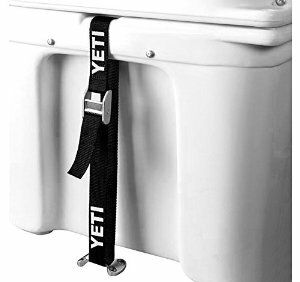 Yeti have pull down T-Rex style latches. OtterBox have rubber latches also but these pull up from the bottom and then click into place in order to give the lid a strong seal. It’s much of a muchness here really. Both style of rubber latches is fine and none is significantly better than the other. 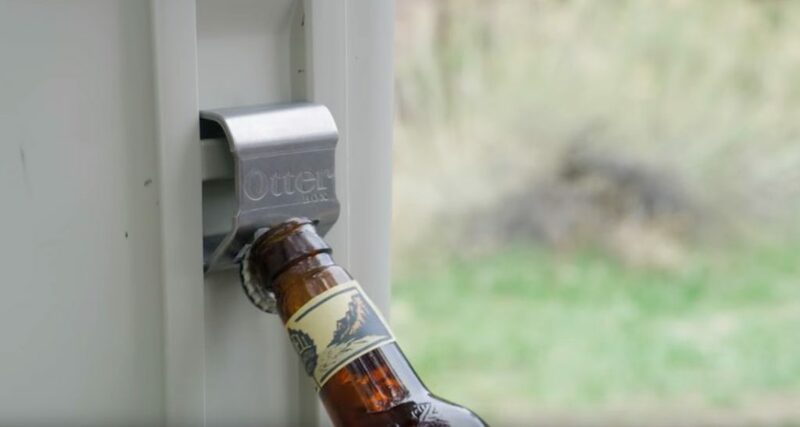 OtterBox have designed their coolers with a unique attachment system so you can easily add and remove accessories at will. 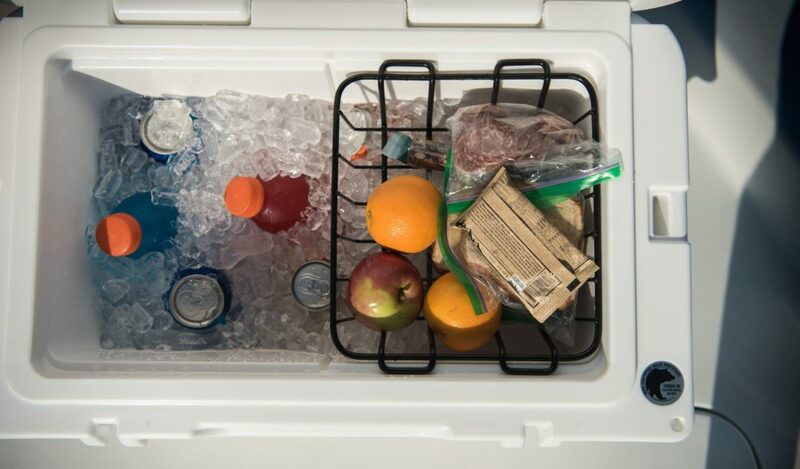 Items like external cup holders, bottle openers, storage pouches and dry boxes can be easily clipped onto the outside of your cooler, and then removed or interchanged at will. This is a cool feature but has limited uses as there are only really 4 accessories (mentioned above) that you can choose from and none of them comes cheap. The double cup holder is $29.99 and the bottle opener is $19.99. My favorite accessory is actually the Slate Grey Side Table which comes in at around $69.99. This has 2 built in cup holders and a spot for a cutting tray. This is a really nice feature and something I would definitely consider buying. OtterBox offer a limited lifetime warranty on their coolers, while Yeti only offers a limited 5 year warranty. 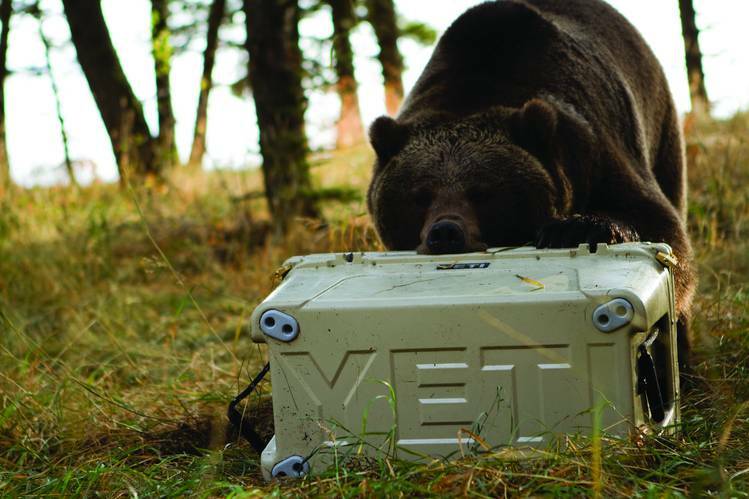 What Makes Yeti Stand Out From Otterbox? So we’ve talked about what makes OtterBox stand out from Yeti. Now let’s take a bit of a look into what makes Yeti stand out over OtterBox and why you might consider a Yeti instead. Yeti basically single handedly created the high-end roto-moulded cooler market back in 2008. They were the first to create such a product and established solid distribution and recognition early on. Now they have morphed from a cooler company into a cult like brand. People know and recognise the Yeti brand and people love the brand. Everything from their products to their marketing screams high-quality and they deliver. Buying a Yeti is like buying an iPhone or a Samsung…people know and trust the brand and they consistently make good stuff. While OtterBox have 3 sizes Yeti have a huge range of sizes. Everything from 20-Quart upwards to over 380-Quart. They also have a wide range of different coolers and tumblers. I recently did a review on their BackFlip 24 which is a really awesome cooler backpack. 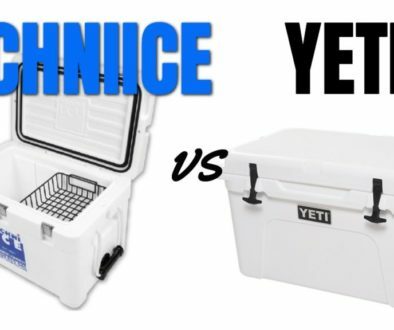 So with Yeti you have way more choice to choose the cooler that is actually right for you. Maybe you don’t like the dual color finish of the OtterBox. Well Yeti coolers come in 3 standard colors. White, Blue and Tan. They also do limited edition runs of other colors and usually Amazon has a variety of colors to choose from. This is something you can’t notice online as it’s really hard to show in photos. 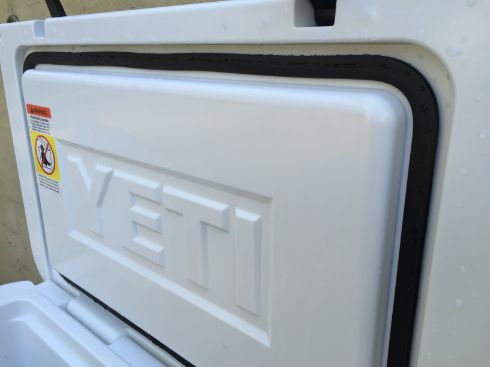 The Yeti has this smooth finish just just feels premium quality. I don’t know how to describe it but it’s like the perfect white and the perfect amount of shininess that it doesn’t look cheap. I know I can’t really say “trust me” because who trusts some random reviewer guy on the internet right? Haha. But yes trust me when I say the finish of the Yeti is amazing and it makes you feel good for buying it. 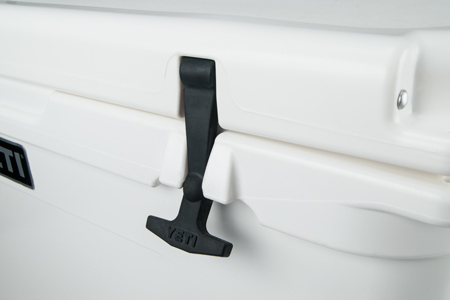 The Yeti has pull down rubber latches to keep the lid in place that are slightly different from the OtterBox. Neither is better or worse they are just different and you may prefer one over the other. Yeti coolers are sold all over the US as well as in a bunch of other countries as well. 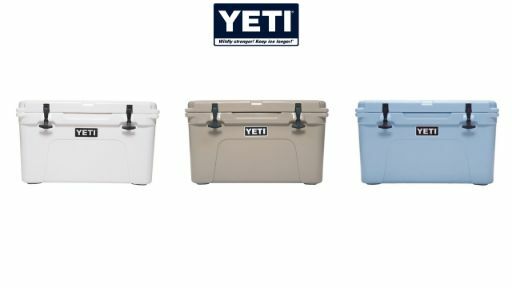 They have wide distribution in specialty stores as well as being easily accessible on Amazon where you can often find rarer colors (click here to see Yeti’s on Amazon). Yeti have been around since 2008 so they have 10+ years in the market with thousands of positive customer reviews. When buying a Yeti you know that it is a tried and true product. No product is perfect so lets have a look at some of the potential problems with the OtterBox. As a newer product to the market and with smaller distribution and sales when compared to the Yeti there is just less real life customer information to go off. Some people rave about it and say ice retention is better than Yeti and RTIC and other says that ice retention is sub-par. This may be from customers not knowing how to make ice last longer in your cooler but who knows? The handles stick out to the side of the OtterBox and this means it takes up more space than necessary in your car/truck/van/boat. This is a deal breaker for some people where maximising space is a necessity. Yeti are the best known brand in the industry but they aren’t perfect either. Here’s some problems to consider when buying a Yeti. While some Yeti coolers are manufactured locally in the states, we don’t actually know which ones or how many. We do know that the Tundra series is manufactured in the Philippines also and the Hopper series is made in China. More on where Yeti coolers are made. So if you want a guaranteed “Made in USA” cooler then Yeti might not be for you. The OtterBox offers a lifetime limited warranty while the Yeti only offers a 5-Year limited warranty. But with both companies this only protects against defects in manufacturing. It’s not an insurance policy for if a bear gets at your cooler or you drop it off your truck whilst driving. 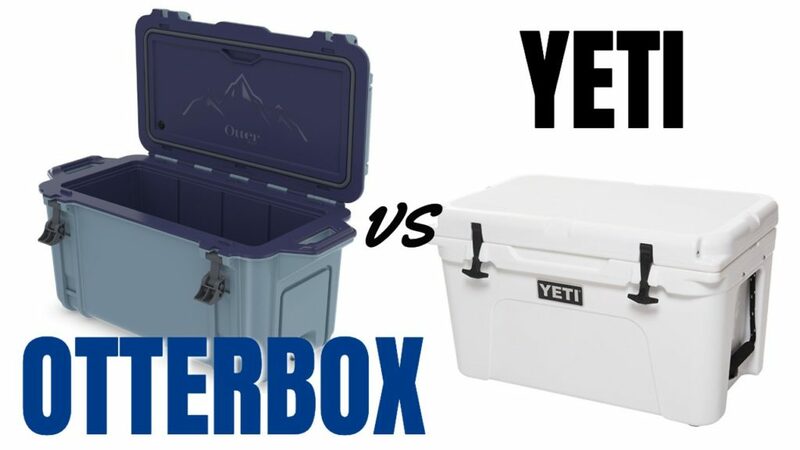 Otterbox vs Yeti: Which Cooler Would I Buy and Why? This one is a tough call. I really like the idea that the OtterBox could potentially have the best ice retention in the business. 14 days ice retention for the 45-Quart?! That’s some insane claims and would be amazing if it was true. Looking at some customer reviews it seems possible, but other reviews make it sound unlikely. 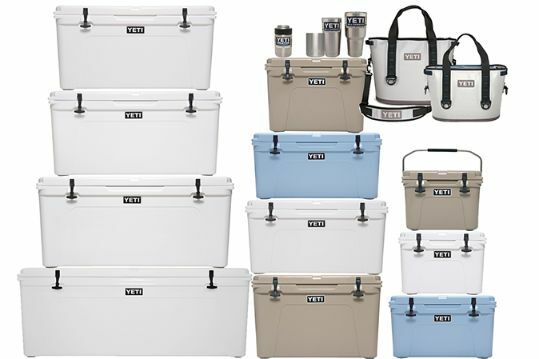 Yeti have a premium finish that I have seen in any other cooler. I trust their quality. Legit that is all it came down to. Those 3 things. Not a big difference right? Which Cooler Should You Buy? 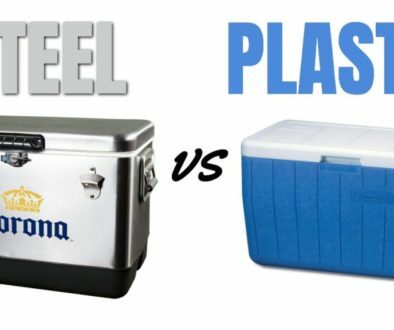 To be honest I hate it when I can’t give a firm opinion and say which cooler I like better and would recommend you buy. With the OtterBox vs the Yeti I can’t do either of those things. Both are well built coolers with unique but beautiful designs. Both are rugged, strong, bearproof and hold ice for a ridiculous amount of time. Both have enough sizes to suit most consumers. Both have good warranties and solid track records as companies for making quality products, OtterBox with phone cases and Yeti with coolers, bags and tumblers. So ultimately the decision comes down to which cooler do you prefer. Do you like the OtterBox has the dual color design, is made in the USA (not overseas) and has those handles that stick out? 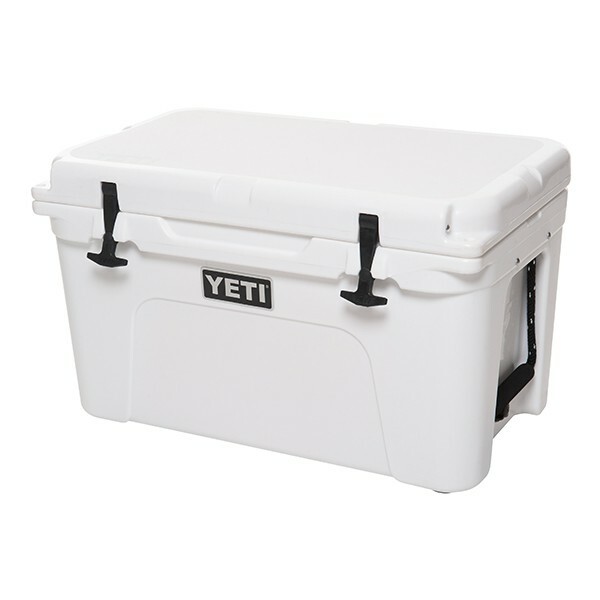 Or do you like the more refined minimalistic design of the Yeti and want the brand name. I’ll link up to each cooler below on Amazon so you can do some further research yourself and decide what is best for you. These are affiliate links so if you use them I greatly appreciate it.